Accueil Produits Bande originale La bande originale de “John Carter”. La bande originale de “John Carter”. Sortie : 6 mars 2012. 1. A Thern for the Worse – 7:38. 2. Get Carter – 4:25. 3. Gravity of the Situation – 1:20. 4. Thark Side of Barsoom – 2:55. 5. Sab Than Pursues the Princess – 5:33. 6. The Temple of Issus – 3:24. 7. Zodanga Happened – 4:01. 8. The Blue Light Special – 4:11. 9. Carter They Come, Carter They Fall – 3:54. 10. A Change of Heart – 3:04. 11. A Thern Warning – 4:04. 12. The Second Biggest Apes I’ve Seen This Month – 2:35. 13. The Right of Challenge – 2:22. 14. The Prize Is Barsoom – 4:29. 15. The Fight for Helium – 4:32. 16. Not Quite Finished – 2:06. 18. Ten Bitter Years – 3:12. 19. 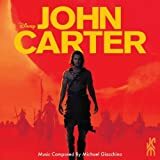 John Carter of Mars – 8:53.